Used QNAP TS-219P NAS Server. Condition is Used. Shipped with UPS Ground. Includes everything in the pictures. From a pet free smoke free house. 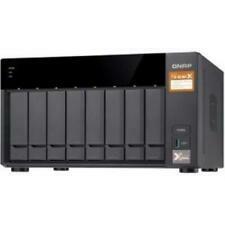 QNAP TS-220 TWO BAY NAS IN GREAT WORKING CONDITION NO HARD DRIVES. Condition is Used. Shipped with USPS Priority Mail. QNAP NAS TS-228, 2-BAY, 1GB RAM, GOOD CONDITION, TESTED! NO HARD DRIVE INCLUDED. 2BAY NAS STORAGE, DUAL CORE 1.6 GHz 1GB RAM DDR3. THIS UNIT WAS TESTED WITH 4TB SINGLE HARD DRIVE, (NOT INCLUDE). INSTALLATION SEEMS EASY, BUT YOU NEED TO DO COUPLE OF UPADATES. POWER ADAPTER 12V-3A. By practicing safe computer habits and with the TS-128A handling your file backup tasks, you can rest easy knowing that your data is safe. A single NAS for cross-platform, multi-device file access and sharing. It is also the first ARM-based NAS that supports Qtier™ technology for efficient auto-tiered storage. Featuring dual 10GbE SFP ports, the TS-932X provides an excellent blend of speed and affordability to future-proof your IT infrastructure for 10GbE networks. Condition is Used. QNAP TS-859 Pro Diskless NAS was used for about a year and put on a self. booted up and installed newest firmware. Its ready to go. 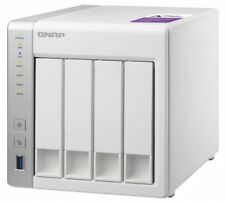 For sale is a lightly used QNAP TS-431P NAS, in excellent working condition. Only includes the NAS unit, original box, and power cable/adapter. No APO/FPOs/PO Boxes. Mfr Part #: QXG10G1T. Full-Height and Specialized (for Selected QNAP NAS) Bracket. QXG-10G1T 10Gigabit Ethernet Card. Form Factor: Plug-in Card. Total Number of Ports: 1. Number of Network (RJ-45) Ports: 1. Manufacturer Qnap. Manufacturer : QNAP. Product Line : QNAP. Content NAS SERVER, 1 CPU E3-1246V3,1 RAM 2GB, 10GbE Built-In, POWER CABLE. Network Storage Type : NAS server. Bay Provided. Host Connectivity (for SD) : Gigabit Ethernet / 10 Gigabit Ethernet. 10GbE-ready, entry-level rackmount NAS for SMB featuring two SFP ports and one PCIe 2.0 ??. 2 slot (??. The TS-432XU can be deployed to suit various needs for data storage, file backup, disaster recovery, containerized applications, surveillance, and more. ). Used QNAP TS-469U-RP was pulled from production. As is - NO HDD. 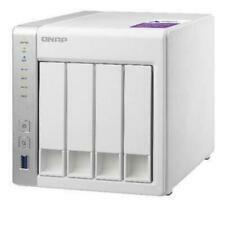 This QNAP NAS has been tested for basic functionality and is ready for use. An electronics refurbisher?. We are always looking for new ways to bring discarded goods into the hands of those that want them! This little box is amazing with all the features it has. I bought this to connect to one of our other servers at 10GB speed, which is fantastic. There are 2 10GB SFP ports on the back, along with 2 standard Gigabit Base-t connections. Fee equal as Expedited. This might affect you if you live in a rural community. partnered with world leaders in technology and. If you order two or more products from us, they may. your first choice for the best products, lightning fast. Expand the total raw storage capacity up to 72TB (with maximum 12 hard drives) with the economical QNAP expansion enclosure UX-800P. Centralize your file storage, sharing and backup. Run a virtual machine and extend the functionality of the NAS with an integrated virtualization solution. I am also including 7x Seagate ST32000644NS 2TB hard drives. 1 drive passes SMART health checks and the others have a few relocated sectors on them so they show the warning status. I have had them setup in a raid 5 for a few years. However I learned that this product does not work being adapted to TB2. It should be a great solution for TB3 uses. Processor Type: Celeron. Check-Out Now! Ethernet Technology: Gigabit Ethernet. Weight (Approximate): 6.61 lb. Form Factor: Desktop. Depth: 9.3". Height: 7.1". Physical Characteristics. The high-performance quad-core short depth TS-431XeU includes a 10GbE SFP port to fully support 10GbE high-speed networks at a budget price with maximized ROI. The short depth design is perfectly suitable for installing the TS-431XeU in a compact rack, or places with a lot of cabling. 8 Terabyte NAS. Can run as a PLEX Server. Network Attached Storage Device. With just three disks you can build a secure RAID 5 array on the TS-328. This provides optimized storage capacity and protection against one disk failing. I opened one box to show contents. Qfiling automates file organization, greatly improving work efficiency. Fee equal as Expedited. This might affect you if you live in a rural community. security to provide you with an easy to use, fully. partnered with world leaders in technology and. If you order two or more products from us, they may. This powerful hardware can also double the encrypted file transfer performance with AES-NI encryption acceleration. The system can be recovered by reinserting the wrongly-removed hard drives so the data can still be accessible. No hard drives are included. It is in great condition and has worked well for my team. Their team is very knowledgeable and can get you set up and running quickly. 7x Toshiba MD04ACA600 (Toshiba 6TB HDD). 16TB (4X4TB) Seagate IronWolf Hard Drives (NAS storage capacity differs from RAID mode). A hybrid approach to virtualization in one NAS: Virtualization Station & Container Station. ATA 6Gb/s, 4xGbE, AES-NI hardware encryption, hardware transcoding up to 4K H.264, 4K HDMI with Kodi player, 2xHDMI, Virtualization Station, Surveillance Station, max 1 UX expansion unit, 2x 6.3mmMIC In, 1x Line out. Like new condition, worked great for transcoding Plex movies and VMs. Needed to get more storage. Does not include HDD. Qnap 215501 Nas Ts-453be-2g-us 4bay Celeron J3455 4core 1.5ghz 2gb (ts453be2gus). Condition is New. Shipped with USPS Priority Mail. I love these things. I upgraded the RAM to 3 TB total. For more on what you can do with the TS-469 Pro and for the detailed specs look at the QNAP link below. Processor Type: Celeron. Processor Speed: 2 GHz. Processor Core: Quad-core (4 Core). Check-Out Now! Network (RJ-45): Yes. Number of Total Expansion Bays: 2. You need to connect to a thunderbolt NAS to power on. Manufacturer QNAP Systems. Product Line Turbo NAS. Product Type NAS Storage System. Atlanta Network Technologies, Inc. Manufacturers change colors and item details frequently and often do not update pictures. QNAP 8GB DDR3 ECC RAM Module - 8 GB (1 x 8 GB) - DDR3 SDRAM - 1600 MHz DDR3-1600/PC3-12800 - ECC - DIMM - OEM EC1279U EC1679U & SAS SERIES QNAP 8GB DDR3 ECC RAM Module - 8 GB (1 x 8 GB) - DDR3 SDRAM - 1600 MHz DDR3-1600/PC3-12800 - ECC - DIMM - OEM EC1279U EC1679U & SAS SERIES. Product Title QNAP RAIL-A03-57 Mounting Rail Kit for Enclosure, Server (RAILA0357). Qnap Rail-a03-57 Mounting Rail Kit For Enclosure, Server - 125.66 Lb Load Capacity (rail-a03-57). Manufacturer QNAP Systems. I have used this QNAP for about 3 years. I have had 0 problems in those years. I upgraded this unit from 2GB ram to 16GB so I could run some VMs on it. It was fantastic until I put 4 VMs on it. I then realized I needed something with a more powerful CPU so I upgraded to a custom freenas server. I am providing 2x 2TB HDDs along with the NAS. Includes power adapter and cord. I can ship this item within 2 business days of receiving payment. Paypal only please. I can ship to the USA only. Including 6 x 2TB SATA Hard Drives! Qnap 219626 Nas Ts-1635ax-8g-us 16bay Marvell Armada8040 Quad-core 1.6ghz 8g Ddr4 Rtl. Product Title QNAP TS-1635AX-8G SAN/NAS Storage System (TS1635AX8GUS). The TS-1635AX can be used with QNAP's VJBOD technology to expand the capacity of other NAS. Product Title QNAP TS-473 SAN/NAS Storage System (TS4734GUS). You can install a QNAP QM2 expansion card to add M.2 SSD caching/10GbE connectivity; a compatible wireless card to use the TS-473 as a wireless access point; and an entry-level graphics card (for example: NVIDIA® GeForce® GT1030) to boost system performance for 4K video performance. Product Title QNAP Turbo NAS TS-231P SAN/NAS Server (TS231PUS). QNAP Turbo NAS TS-231P SAN/NAS Server (ts-231p-us). Manufacturer QNAP Systems. High Efficiency with dual LAN support The TS-231P supports multiple port-trunking modes, enabling administrators to set up link aggregation to increase total data transmission potential. Product Title QNAP TS-832X-2G SAN/NAS Storage System (TS832X2GUS). QNAP TS-832X-2G SAN/NAS Storage System (ts-832x-2g-us). The powerful 8-bay, quad-core TS-832X includes two 10GbE SFP ports to fully support 10GbE high-speed networks at a budget price with maximized ROI. Use the TS-431X2 to expand the storage capacity of other QNAP NAS with VJBOD. The TS-431X2 not only provides two inbuilt Gigabit Ethernet ports but also one 10GbE SFP port to fully support 10GbE high-speed networks. Product Title QNAP Powerful NAS with AMD RX-421BD Quad-Core APU and PCIe Expandability (TVS473e4GUS). QNAP Powerful NAS with AMD RX-421BD Quad-Core APU and PCIe Expandability (tvs-473e-4g-us). The AMD RX-421BD APU, featuring an integrated Radeon™ R7 series Graphics Processing Unit, provides the TVS-473e with the high-end model of the AMD R-Series family.